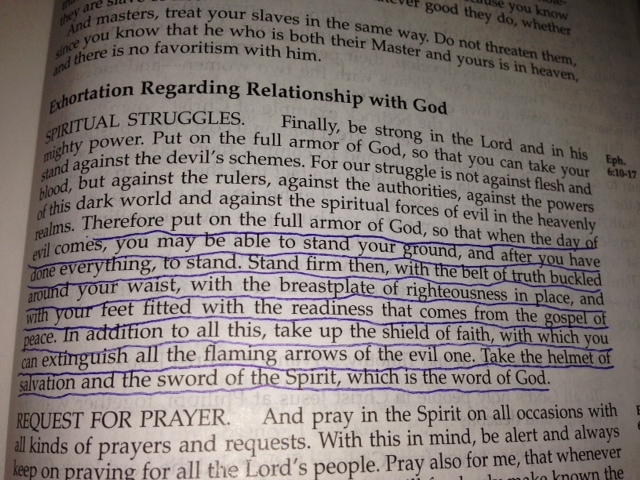 “Take up the shield of faith in order to extinguish all the flaming arrows of the evil one”, Paul tells us in Ephesians. These flaming arrows definitely come at me when I least expect it. I’m confident Satan plans it that way. Here’s an arrow that comes at me – I get an opportunity to say something bad (but true) about someone I don’t like or who has done something unkind to me. My shield of faith has to be up and in place if I’m going to keep my mouth shut on that one. Another arrow comes my way! Satan loves to arrange it so that I don’t pay for everything in my cart at stores. I hate to waste the time to go back and pay for something when I realize that it was missed in the check-out process. I need my shield of faith in place to help me remember that my integrity is more important that the inconvenience. Another arrow – sometimes I feel surrounded by people who are lacking morals and good judgement in their personal lives. My shield of faith needs to be up and ready so that I can accept these people and love them with the love God gives to me. Satan would be pleased if I would judge them and forget to be compassionate. My shield of faith helps me dodge that arrow. These are flaming arrows which can really hurt me if my shield isn’t up. They can make my behavior not pleasing to God. They can also make me look more like a servant of Satan than a beloved child of the One True God. So I need to have my shield of faith up and ready every day. I never know where the flaming arrows will be coming from. Thank you, dear Father, for my shield of faith.